Similar Exide facilities in Los Angeles and Frisco, Texas, have contaminated nearby communities with lead, leading to cleanups costing hundreds of millions of dollars and toxic tort claims exceeding $3 billion, the coalition told the U.S. Department of Justice. Last summer, an Exide consultant found lead in the ground water below the Muncie facility at seven times the concentrations for safe drinking water, as well as lead in the soil at levels 16 times the standard for industrial sites. Based on surveys in other Exide communities, Frank suspects the company also has contaminated the soil for several miles downwind of the Muncie facility. Lead recycler a threat to Muncie kids? MUNCIE â€“Â A coalition of environmental groups says the federal government isn’t doing enough to protect Muncie children from lead emitted into the air by the Exide Technologies battery recycling/lead smelter facility. Exide has agreed to pay $820,000 in civil penalties and to spend $4 million on new pollution control equipment to settle a federal lawsuit accusing the company of once again violating the Clean Air Act. But the coalition says the proposed settlement doesn’t require Exide to retrofit the facility with the best available air pollution control technology â€” wet electrostatic precipitators â€” to dramatically reduce emissions of lead and other pollutants. Exide announced earlier this year that it would immediately move to close its battery recycling facility in Vernon, Calif., under the terms of a non-prosecution agreement reached with federal prosecutors to settle a criminal investigation of the company. Other members of the coalition include the Sierra Club-Hoosier Chapter, the Robert Cooper Audubon Society in Muncie, Improving Kids’ Environment, Earth Charter Indiana, Citizens Action Coalition, Save the Dunes, Indiana Public Health Association and Hoosier Interfaith Power & Light. According to the U.S. Environmental Protection Agency’s Toxics Release Inventory (TRI), the Exide Muncie facility on Mount Pleasant Boulevard released 3,159 pounds of lead into the air in 2003. That amount dropped to 1,743 pounds by 2007, then to 736 pounds in 2012 and to 254 pounds in 2013, the latest year for which data are available. 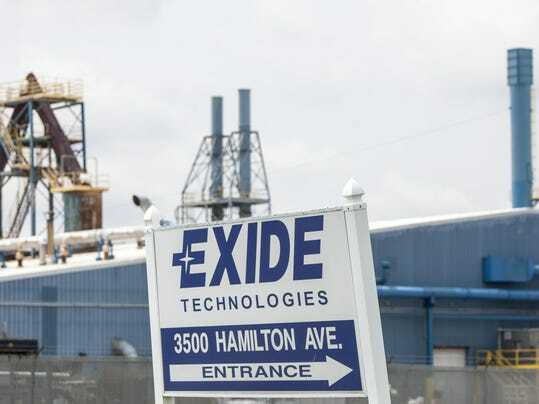 Exide employs about 170 people in Muncie, where millions of lead-acid automotive, truck and other batteries are recycled every year. A global company, Exide is emerging from bankruptcy. It also operates a secondary lead smelter in Canon Hollow, Mo. While recycling hazardous lead-acid automotive batteries keeps them from being dumped in landfills, illegally dumped or shipped to other countries where regulations are lacking, Exide’s recycling facilities in Muncie and other locations often are cited for environmental violations themselves. The Muncie facility is called a secondary lead smelter. Primary lead is mined. Secondary lead is recovered from spent batteries. Several weeks ago, lawyers representing the justice department told U.S. District Judge Tanya Walton Pratt in Indianapolis that current EPA regulations do not require secondary lead smelters to use wet electrostatic precipitators. The justice department has not yet completed its consideration of the environmental coalition’s comments, which were accompanied by more than 600 pages of attachments..
“Exide is working directly with regulatory authorities concerning its Muncie recycling facility, but as a matter of course, Exide does not comment on any ongoing administrative proceedings,” spokeswoman Kristin Wohlleben told The Star Press.